If cuts to Medicare and other social programs follow a tax cut, it would fly in the face of what regular folks said are their top priorities in a new Kaiser Family Foundation poll: Only a small minority of Americans support tax cuts if they involve cuts to Medicare, Social Security, and Medicaid. That future could arrive much sooner, too, if the final tax bill shakes out a certain way: if Congress doesn’t come up with offsetting revenue increases or spending reductions, Medicare and other social programs will see automatic cuts under current budget rules unless at least 60 members of the Senate agree to waive these cuts. Administration officials and other proponents of the tax cut argue that it will encourage businesses to invest more, spurring economic growth, which will, in turn, generate more federal tax revenues. Many economists agree on this: tax cuts could help boost growth, but they also contend that they do not generate enough additional tax revenue to “pay for themselves,” making larger federal deficits inevitable. If they are right, larger deficits could be ”used to argue that deep cuts to Medicare, Medicaid, Social Security and other bedrock programs are necessary,” to close the future deficit, the Medicare Rights Center, a consumer organization, warned recently. The Congressional Budget Office projects that the deficit is already poised to deepen in coming years. 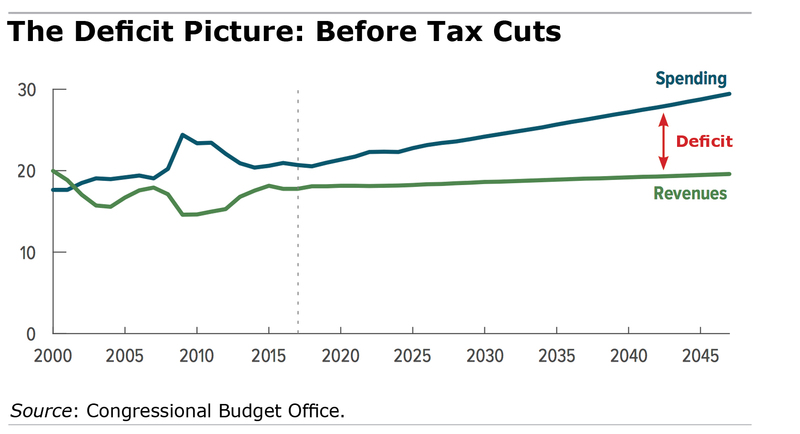 The 10-year, $1.5 trillion tax cut, if it passes, would make things worse. If the middle class sees a smaller tax bill from the new legislation, their personal finances could also be strained more in future debt-curbing legislation, either through tax hikes or benefit cuts. It’d be interesting to see an analysis of the net gains or losses for the middle class when these effects are included. Baby boomers whose retirement is largely baked in won’t be that affected by an expanding deficit. But we should worry about our kids. If these tax cuts end up requiring cuts to social insurance programs, that’s a feature not a bug. It’s called starving the beast, and Republican politicians have been promising it to their liberatarian donors for generations. To date, they’ve had trouble following through, but promises are like that. The worst effect may be the cuts required to Medicaid since not only the federal deficit is affected but also state budgets due to the possible loss of revenue from the loss of the state and local tax deduction. The tax cuts will make state and local budgets that much harder to fund. I suppose it depends on whether efforts to “starve the beast” really have the effect of starving actual people in need instead. And promising the generations now over age 60 that they could have lower taxes and there would be no price to pay, for themselves. Only the poorer generations to follow. Which generations voted for this? And it isn’t an anomaly. These are generations that wanted to pay in less and take more out of everything — business, government, the family. Trump is THE MAN of his generation. The general public’s misunderstanding of trust fund accounting obscures the immediacy of Social Security and Medicare funding crises. Neither program has real reserves on which to draw. Those “reserves” are nothing but IOU’s from one part of the federal government to another. Many so-called experts ignore that all federal bonds – in fact, all public and private bonds – are exactly IOUs. But the special purpose Treasury bills held by the two trust funds are very different from corporate and municipal bonds. Corporate bonds have an identified source of funding for payback: the future operating profits of the corporation’s business or businesses. Municipal bonds also have identified sources for payback: sales taxes; water utility revenues; property taxes; stadium lease payments. The funds for repaying the debt held by Social Security and Medicare trust funds has not been identified. It is assumed that Treasury will redeem those T-bills as needed by the programs. But how? The federal government is already spending more than it takes in. So how can it give more to Social Security and Medicare? The funding crisis for these programs is not a 2029 or 2034 problem. It’s a crisis right now. The expenditures for Social Security currently exceed the payroll taxes collected for the program. The expenditures for Medicare currently exceed the payroll taxes for Medicare. And the gap will continue to increase as the largest group of Boomers start retiring. A solution for Social Security and Medicare funding is needed now. We cannot wait 12 or 15 years.